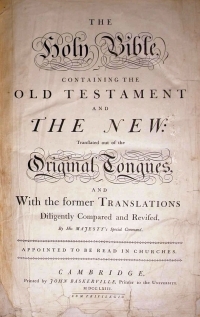 The 1763 John Baskerville Bible. A friend commented last night that the whole country is going to Hell because Mr. Obama won the general election, and we voted for a lesbian senator. “Hell” here is capitalized because this friend meant it literally. We are not living Biblically and are therefore Hell-bound. I wanted to retort angrily. Oh, so many angry retorts on the tip of my tongue. But what we really voted for last night is the idea that we cannot tell each other what Bibles to live by. My friend can have his Bible, I can have mine, you can have yours, and we all live in a civil society. Life is good. It is important to some people that the Bible be literally true. As an outsider, this seems impossible to me, and the mental gymnastics necessary to justify such a faith seem pretty exhausting. This could be approached with a sort of Zen mysticism, meditating on the paradox of the matter, but folks with this sort of faith are often against anything that smacks of Buddhism. Any faith not their own is Satanism. Here we have a deep-seated fear of ambiguity. My friend was literally shaking with fear and rage that our election was making us Hell-bound. On the flipside, some of the most important theologians of our age may have been the existential ones. Buber, Van Kaam, Tillich, and the psychological existentialists like May, Schneider, and Hoffman, the latter two still helping us adjust to an ambiguous world. These are all people who suggest that embracing ambiguity is the way to peace, wisdom, and mental health. The Bible in question is full of absolute statements, but we cannot possibly know which, if any, are true. We can react to this by grasping our truth more tightly or by relaxing into the mystery of the thing. I’m fine with either approach so long as my own rights don’t get squeezed in the process. In therapy, we can approach our clients with this same anger and fear. They live lives sometimes full of chaos, bad decisions, sin, or self-destruction. We might even be angry sometimes about what they are voting for with their actions. But we have to hold our beliefs quite loosely. Our beliefs are often tightly-held knowledge about method, interpretation or underlying process in mental illness. About the best way for people to live—what constitutes the “good life,” as Louis Hoffman often notes. These beliefs can really cause our clients to either revile us, to try to change in order to please us, or both. If held too tightly, they rob our clients of their freedom just as voting the Bible could rob me of mine. People have to change (or not) for their own reasons, or our therapy is perverse oppression. This is sometimes a challenge for me. I sometimes hold my existential or nihilistic viewpoints very tightly and can react fairly strongly to fundamentalist religion, blithely unaware of how “fundamentalistically” I am holding my un-religion. I choose to embrace ambiguity to the extent possible and can be unduly critical of those who choose not to, seeing this as “the” path to healing. Whether in politics or religion or therapy, my advice is just to hold it loosely.